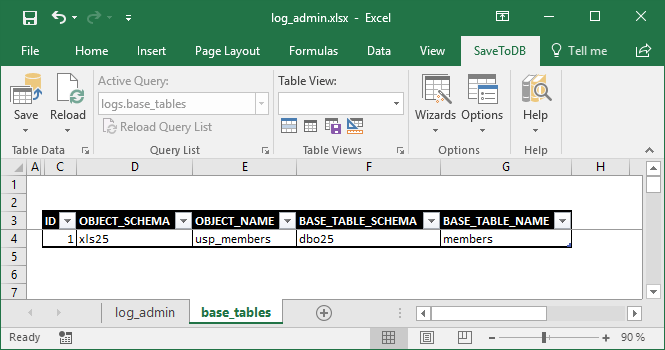 logs.base_tables This user table contains a configuration used to attach context menu items to database objects. logs.change_logs This application table contains change tracking data for all captured tables. logs.formats This application table contains Excel table formats of the change tracking framework objects. logs.handlers This application table contains event handler configuration of the change tracking framework objects. logs.tables This application table contains initial object_id and table names. logs.translations This application table contains translation data of the change tracking framework objects. logs.workbooks This application table contains workbook configuration for SaveToDB Application Workbooks wizard. This user table contains a configuration used to attach context menu items to database objects. Use this table to link views and procedures to the underlying tables. The framework generates context menu items for such views and procedures using settings of the specified base tables. See also Attaching Context Menus. This application table contains change tracking data for all captured tables. Do not edit this table manually. The table contains primary keys and both current and previous row values of source records in an XML format. This application table contains Excel table formats of the change tracking framework objects. This application table contains event handler configuration of the change tracking framework objects. The framework also inserts and deletes handlers of every captured table here. Such handlers define the context menu actions to select and revert changes. This application table contains initial object_id and table names. ✓ object_id int Table object_id obtained on creating change tracking triggers. TABLE_SCHEMA nvarchar(128) Table schema obtained on creating change tracking triggers. TABLE_NAME nvarchar(128) Table name obtained on creating change tracking triggers. The application uses this table to find the target table after changes in object_id or table names, but not in both. This application table contains translation data of the change tracking framework objects. You may use the logs.usp_translations procedure to edit translation for multiple languages in a pivot table and the logs.view_translations view to check and edit the translation of all database objects.